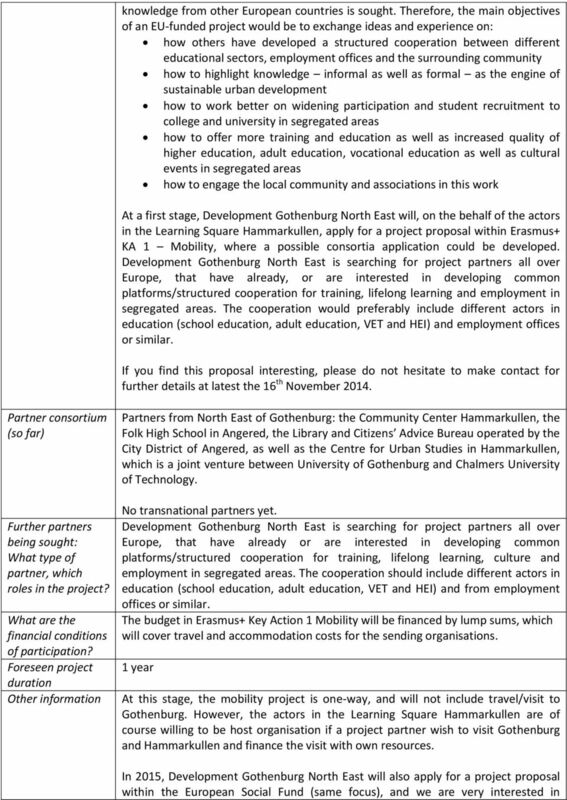 Download "Partner Search: Erasmus+ Key Action 1 - Exchange of experience on common platforms for training, lifelong learning and employment in segregated areas"
1 Partner Search: Erasmus+ Key Action 1 - Exchange of experience on common platforms for training, lifelong learning and employment in segregated areas Applicant: Development Gothenburg North East, City of Gothenburg Organisation: Development Gothenburg North East Development Gothenburg North East is a public company owned by the City of Gothenburg. Its mission is to promote urban sustainable development in the northeastern neighborhoods of Gothenburg by increasing the attractiveness and growth through the development of entrepreneurship, culture and creative industries, green businesses and urban-rural environment. The organization is contributing to integration and cohesion in the city and region. Between 2011 and 2014, the company ran Sweden s largest urban development project financed by the ERDF with the goal to work with sustainable urban development in the North East of Gothenburg. 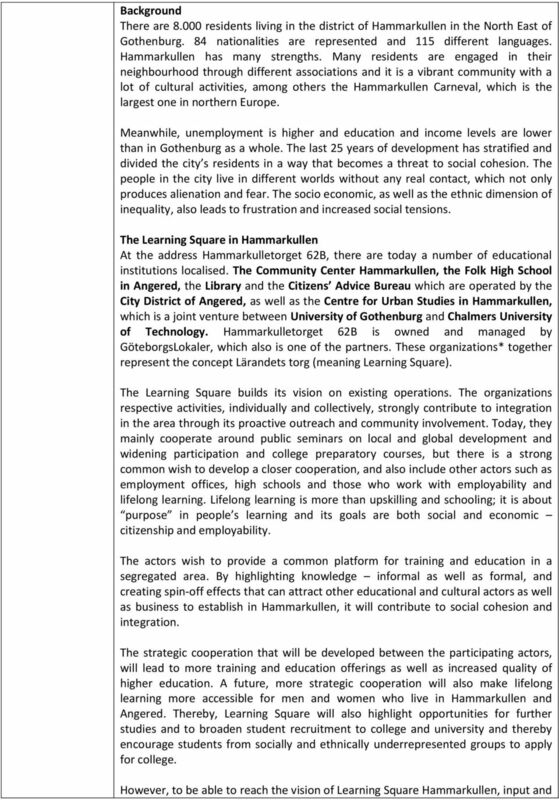 The project focused on the following four themes: business, culture, urban environment, vision and communication, and was a joint venture between the Angered and East Gothenburg City District Administrations, Business Region Gothenburg, the Supply of Premises Administration and the Traffic and Public Transport Authority. The project was realized by the people who liv, work and visit the North East. The North East of Gothenburg includes the two city-districts of East Gothenburg and Angered an area with inhabitants originating from more than a hundred different countries, giving the area an international character. Compared to Gothenburg as a whole, the inhabitants are younger and income and education levels are lower. Many of the residential buildings in the area were built during the Million program" period ( ) when the Swedish government built one million homes during 10 years due to the rapid increase of the population. Title of proposed project Funding programme Deadlines: Call and EoI Description of project idea incl. 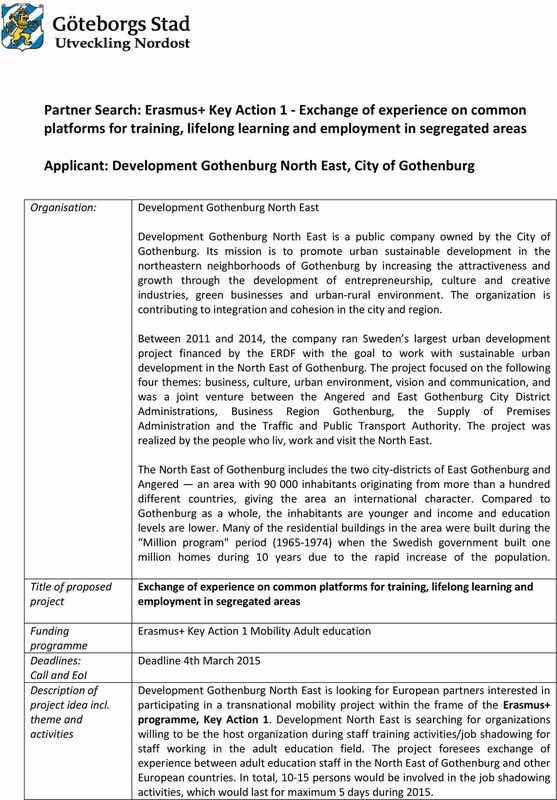 theme and activities Exchange of experience on common platforms for training, lifelong learning and employment in segregated areas Erasmus+ Key Action 1 Mobility Adult education Deadline 4th March 2015 Development Gothenburg North East is looking for European partners interested in participating in a transnational mobility project within the frame of the Erasmus+ programme, Key Action 1. Development North East is searching for organizations willing to be the host organization during staff training activities/job shadowing for staff working in the adult education field. 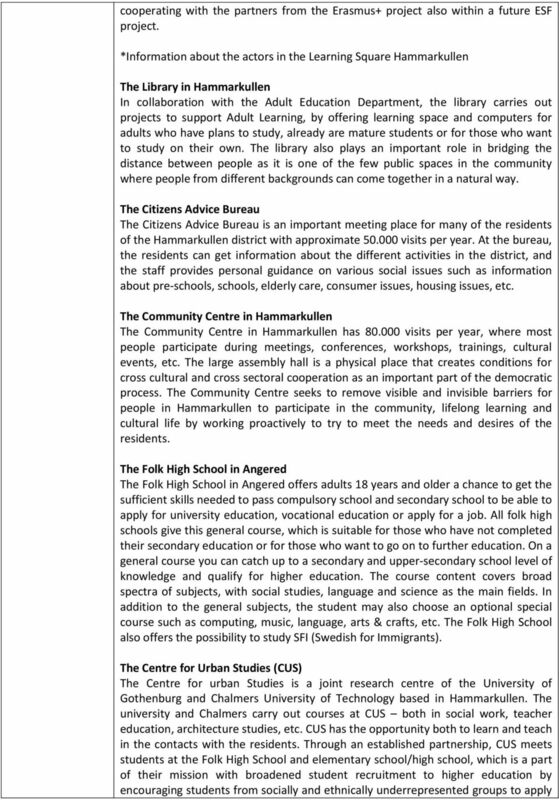 The project foresees exchange of experience between adult education staff in the North East of Gothenburg and other European countries. In total, persons would be involved in the job shadowing activities, which would last for maximum 5 days during 2015. The EU - opportunities and prospects for young people. Community Led Local Development (CLLD) What is it and how could it work? As part of its Internationalising Higher Education programme, the British Council in Ukraine is pleased to announce a call for bids to develop and deliver capacitybuilding workshops for Ukraine university.